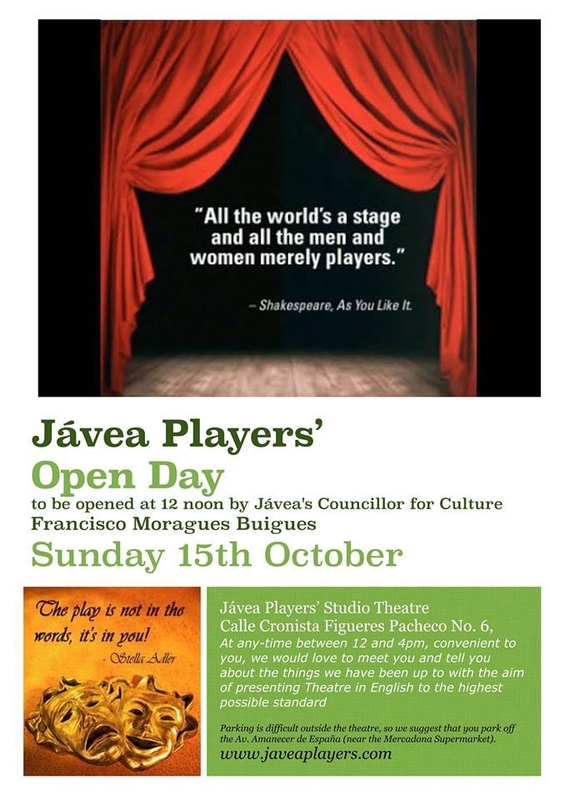 You are invited to join Javea's Councillor for Culture, Quico Moragues at a Cava Reception to open the Javea Players' Open Day at noon on Sunday 15th October. While enjoying a complimentary glass of wine and some light snacks you will be able to view the recently installed Studio facilities and photographic/video displays showing our Workshop and Costume/ Props stores in Gata and other photos of interest. Tables will feature Sound, Light, Singing, Acting and Make up exhibits manned by JP members. Whatever your interest in the theatre might be, an hour or so at the Javea Players' 'at home' on Sunday 15th October is likely to be informative, entertaining and enjoyable. Make it a date.